3 Embellishments. 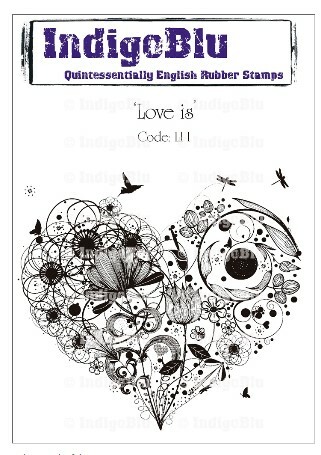 The embellishments must include 1 heart. Please list the ingredients you have used for your recipe in your post. This is the first time I have ever hosted a challenge and so I decided to try a recipe, after all I do like cooking as well as crafting lol. It has turned out to be harder than I expected to stick to it. 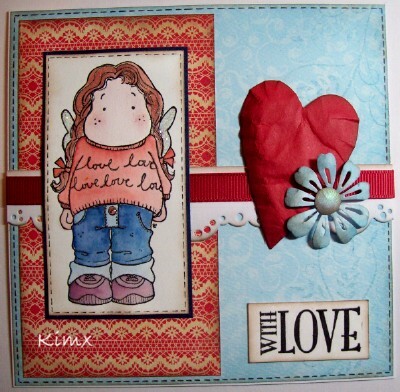 I have used Tilda wearing Love Jumper for my main image, 2 design papers from my stash and my 3 embellishments are a Die cut heart, a DooHickey flower and some ribbon. Please let me know in your post what ingredients you have used in your recipe. My ingredients were two backing papers, one image and three embellishments, two flourishes and a little heart on the I of anniversary. My 1,2 3 are a Ching Chou Kuik image coloured with Promarkers, two papers from Papermania and three embellishments - two die cut flowers and a heart gem. 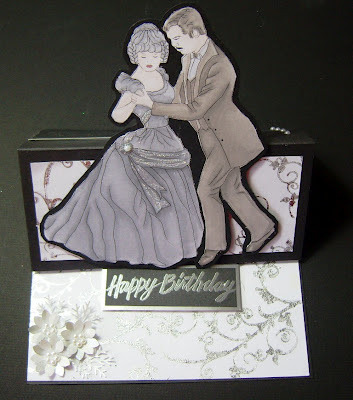 I used an old Tilda stamp for my card. She, of course, is my 1 image and is watercoloured with a bit of glamour dust for sparkle. My 2 DPs are the heart paper (Me & My Big Ideas) and the large flower paper (twelve x 12). My 3 embellishments are the flower and two heart gems. My image is a Kanban Urban Belle. The papers are Brenda Pinnick - and I've used them to paper piece the image too. And I decided to make all three embellishments hearts!! For my card I used a photographic image from a cd, backing papers from Papermania and K and Company and my embellishments were 1) ribbon bow, and 2) 2 stamped hearts. 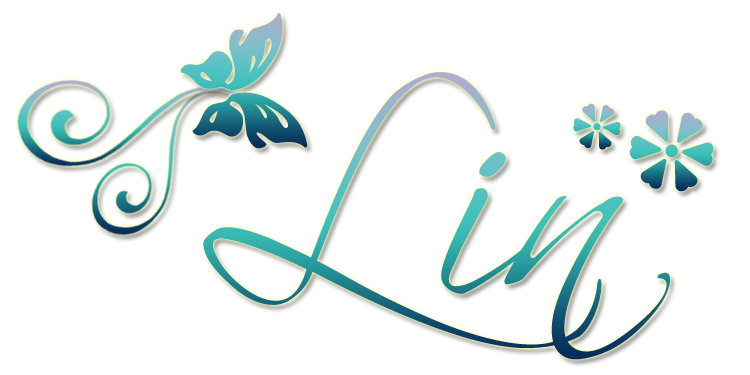 Finally, I used a sentiment stamped onto a nestie shape. 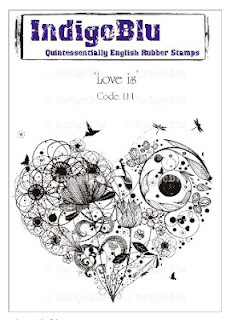 To meet the challenge this time I've used a favourite stamp from LotV, two papers from First Edition and my three embellishments are brads - one of which is a heart. My recipe 123 is, 1 Paper Artsy stamp for my main image, 2 backing papers Kanban and 3 embellishments, ribbon, mesh behind the image and the heart on her head. A lovely challenge ! I met the requirements by using 3 embellishments (including 1 heart as required) 2 DP's & 1 image, nice to have a limit on the amount of *stuff* we are able to put on our card. 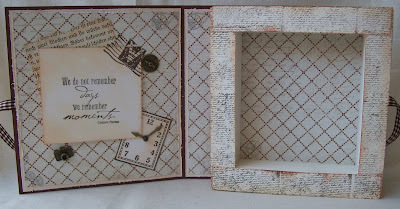 For this 123 recipe challenge I've used a Papermania stamp & 2 DP. My 3 embellishments are ribbon, a beaded pin & a heart charm. 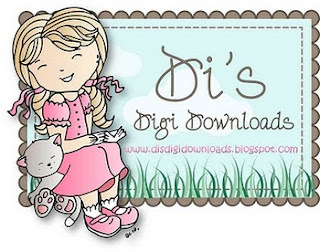 Please visit my blog for more details. 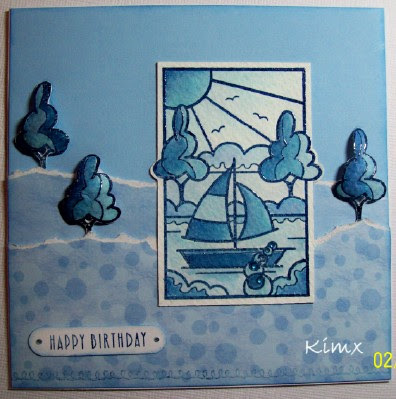 For this challenge I used the paper and the Faith of nature Stamp Set from Stampin Up. Embellished with ribbon, pearl and little heart. 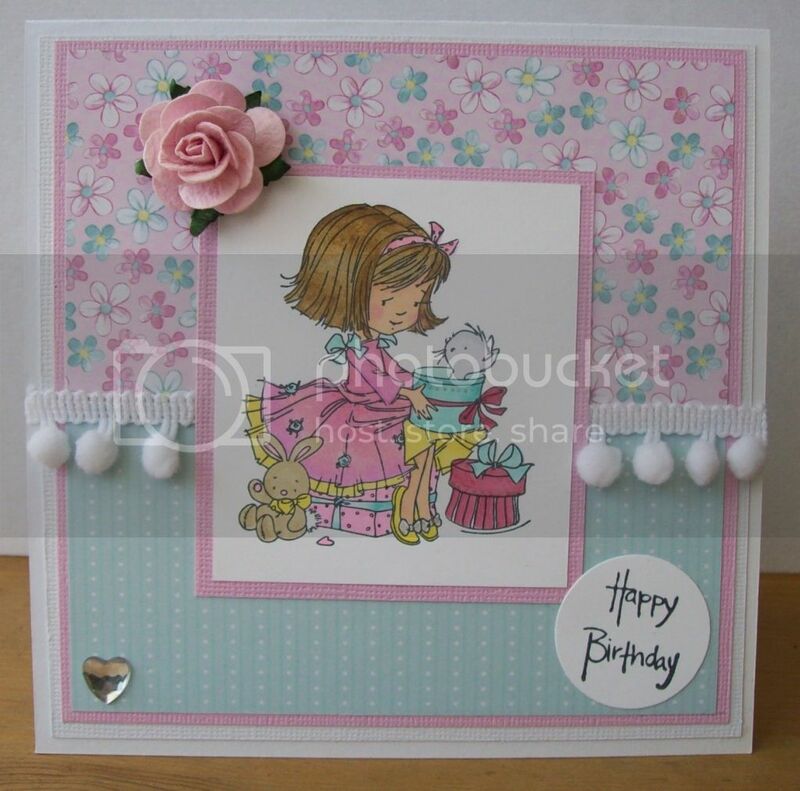 For the Challenge I used my wee Tilda Stamp coloured with promarkers, 2 sheets of my My Minds Eye "Lost and Found" papers and my 3 embellishments are ribbon, flowers and gems! Plus a little papers heart for Tilda to stand in! I want to add that sadly some of you entered way more than the 15 challenges we allow, including our own, or just didn’t follow the challenge criteria and had to be discounted from the prizes and Top 5 positions. For my first ever hosted challenge since I joined the DT I really didn't have to think too hard about what I wanted to do. I love monochromatic projects and for that reason I have based my challenge around that theme. You can use any colour you choose, it doesn't have to be black, but I want to see your creations made using only shades of one colour. I will allow highlights of one different colour, but it must not be a major player in your project. You can also, of course, use skin tones and hair, but other than that please stick to the one colour. 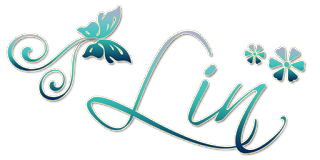 Any creations entered which do not meet the criteria listed above will not be eligible for our fabulous prizes nor for one of our Top 5 spots. So please ensure your challenge meets the criteria if you don't want to miss out. We are seeing an increasing number of entrants who are either not reading our rules, or properly reading what we are challenging you to do and as we need to be fair to those people who do play by the rules we need to be strict with those who don't. Please also remember we only accept entries from people who have entered NO MORE THAN FIFTEEN CHALLENGES, so 14 plus this one. 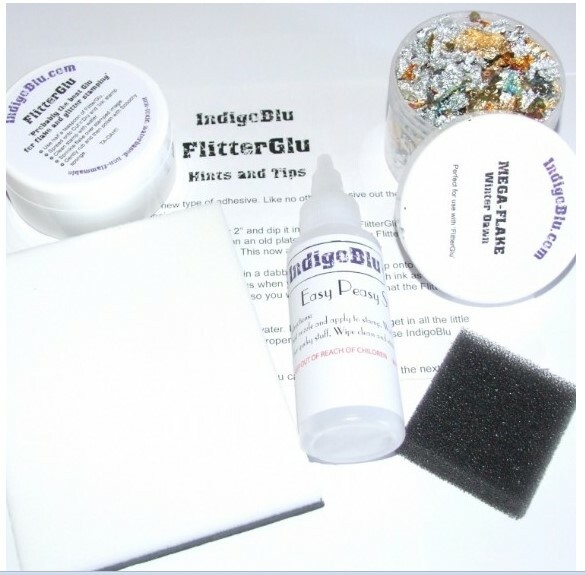 and we have a fabulous prize on offer from them It's a two parter and for those of you who watch Create and Craft TV you will know what an absolutely fantastic prize this is as it has sold out each time it has come to air. I had great fun making this card and I do hope you all enjoy my challenge as much as I did. I can't wait to see what you all come up with! 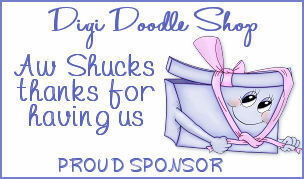 If you need any more inspiration, please check out the rest of the DT's blogs. They have come up with some truly stunning projects! 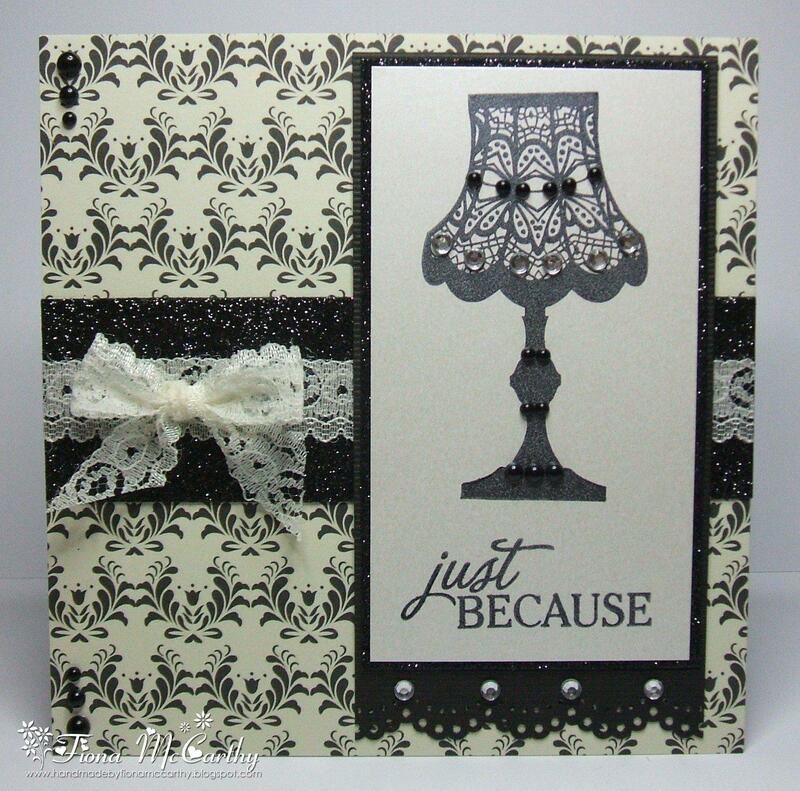 I don't normally do monochrome cards but on the Pollyanna and Pals CD there are lots of lovely monochrome toppers so I used one of those. 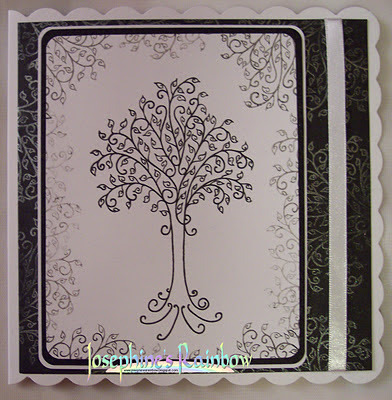 I choose the topper size I wanted from the sheet rummaged for a black card to fit and found this one. 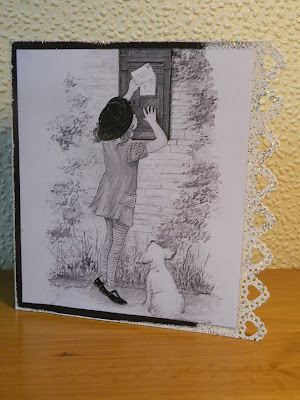 As the size was so close I couldn't do much in the way of embellishing so I went for a punched edge and as I had been playing with my embossing powders decided to add an embossed edge to the card for something a bit different. 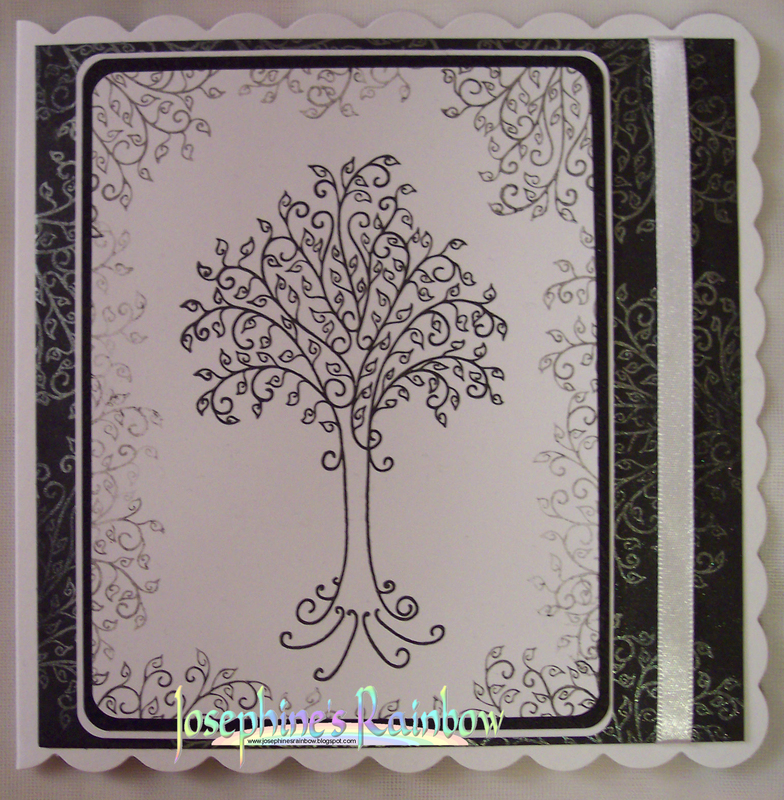 For this, I used a Clarity stamp called Wrought Iron Tree. 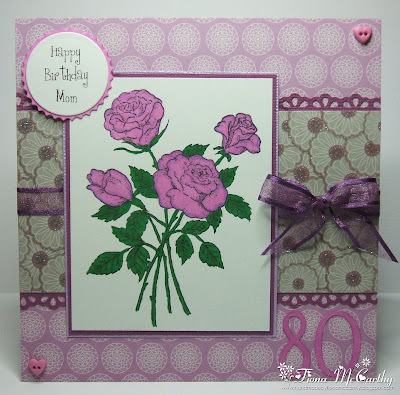 I stamped it onto white card using a Versafine stamp pad, then edged the card with the same stamp using second and third impressions only. 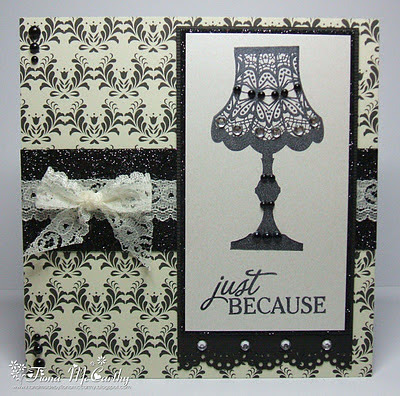 The background was stamped with the top of the same stamp, but using Versamark, I then used Perfect Pearls in 'Perfect Pearl' to bring out the stamping. You know the times when you colour an image a certain way and then have doubts to you having suitable papers... this was one of those sessions... Thankfully a rummage turned up a pad of basic grey Kraft papers. 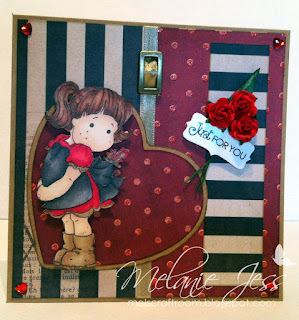 I have used Tilda with chains from the new Magnolia alentine release coloured up using copics using the brown colour wheel, paired with the basic grey papers and some vintage lace, ribbon and paper flowers. Vintage Man Card my first. I used paper and card stock in brown and beige . 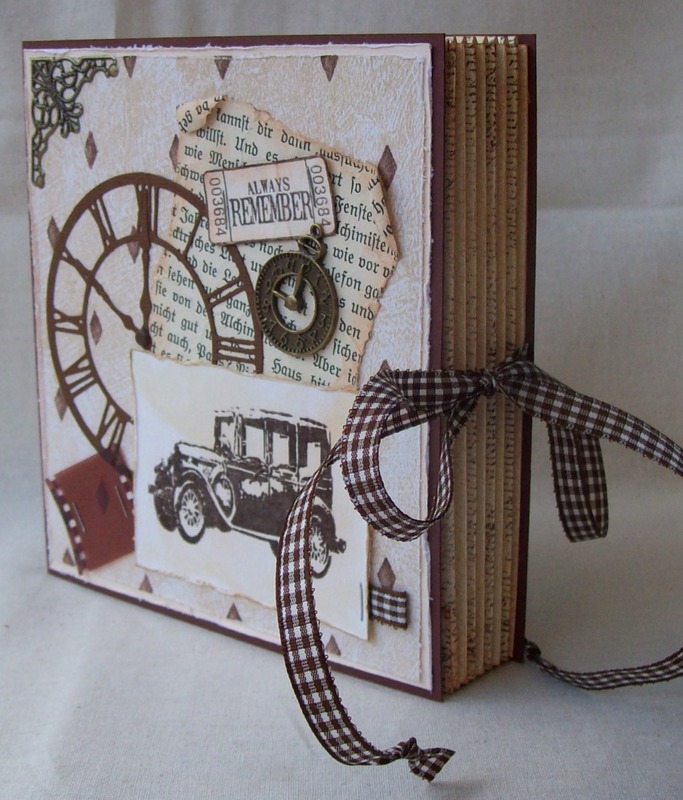 Stamped old car image from Tim Holtz in brown , then edged the watercolour paper with Distress Ink Pad for the old look . 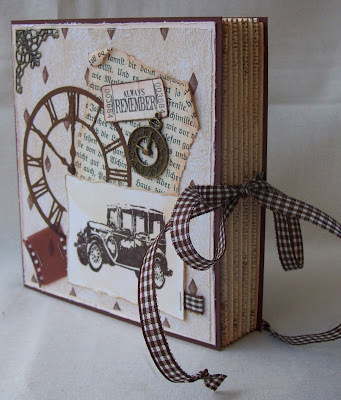 Decorated with Lifestyle Crafts Clock Die cut and a old German book page , negative film strip , charm and stamped ticket . I love this look whatever colour is used & some of my designs end up monochrome without me even realising it! I chose a simple design for this challenge using different patterned papers from the Papermania Boysenberry Capsule Collection pad. I punched 4 scalloped squares & placed a teeny white peel off shape on each one. The sentiment is made with a lilac Dymo strip although it looks blue in the pic. I finished the card off with some lilac baker's twine. I decided to go for green for my monochromatic card. It's all created with white card and Bundled Sage Distress Ink - apart from the stitching detail and embellishments of course!! The image is a favourite of mine from Kanban - and for some reason whenever I use it, I always seem to reach for the mica powders too!!! Blue is my choice of colour for this monochromatic challenge. 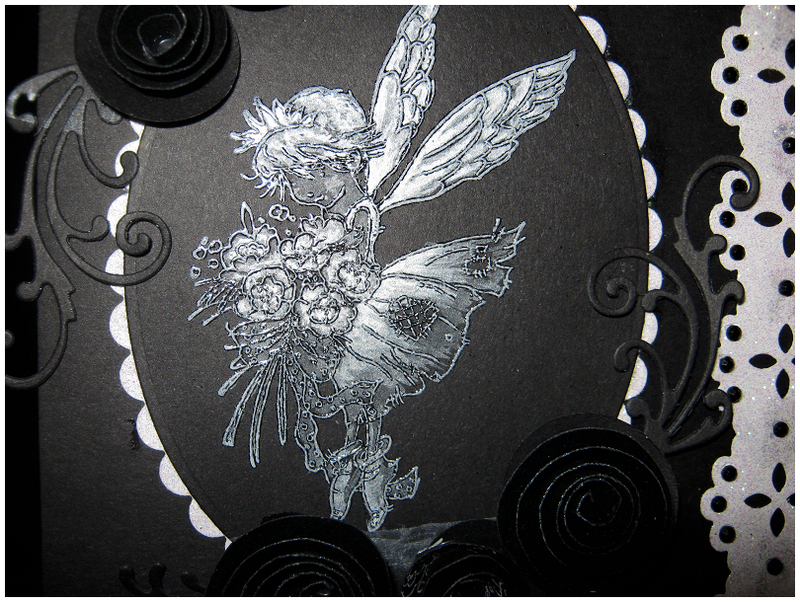 I used a variety of blue distress inks to make the background, the stamps are all from Chocolate Baroque. The border edge was made with a Martha Stewart punch. For my card I have used a stamp from MME Stella and Rose Collection and the sentiment stamp is from American Crafts.The DP is from Craftwork Cards. I have added lots of pearls and bling to the lamp image to glitz it up. Lace, pearls, bling and glitter paper are all from my stash. 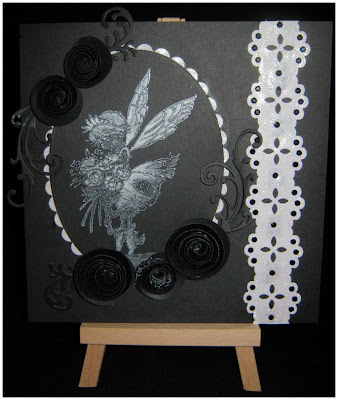 For this I went with the classic monochrome colours of black and white with shades of grey in between and I'm quite comfortable colouring in greyscale so to challenge myself I tried a CAS card which is not my usual style. 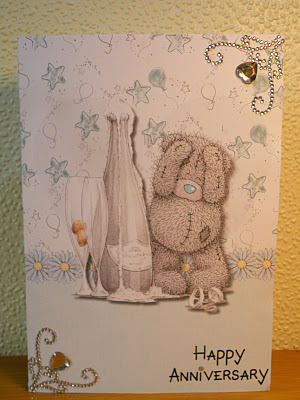 I stamped image in the corner and coloured with promarkers then cut out tiny 1cm squares and stamped lettering. The black layering I also added black diamond stickles yum! When I read this challenge for some reason the idea of classic Wedgwood Pottery came to my mind so I had a go at emulating that style using a mixture of blue distress inks and white embossing powder. I painted the flower petals with watered down white acrylic paint to try to capture the fine detail you see on the pottery. To finish off the card I added blue pearls and navy blue card. 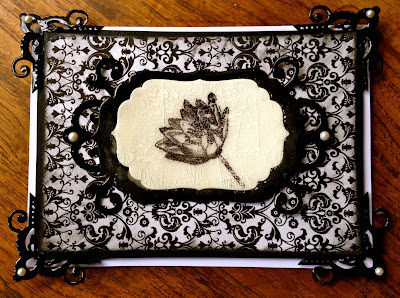 I too stuck with the classic black and white for my card as it is one of my favourite combinations. 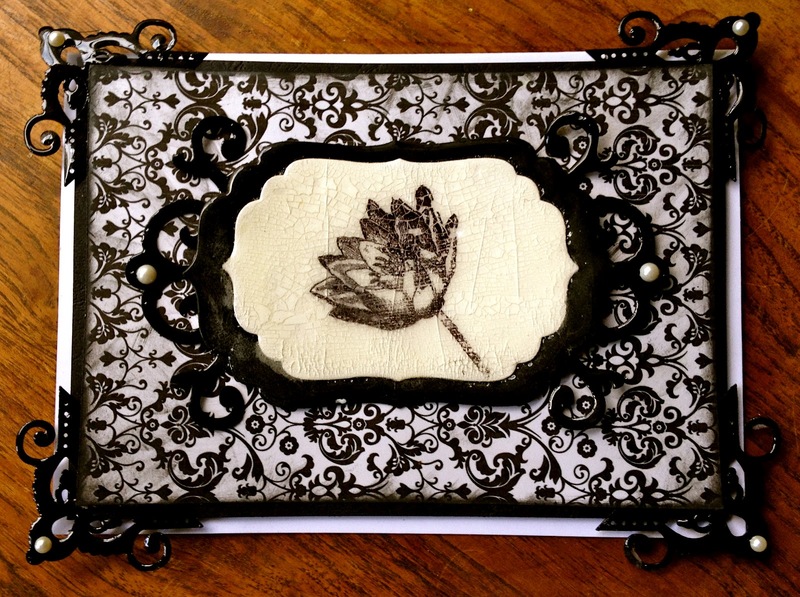 I created the patterned paper with my Cameo adding black ink to the edges. 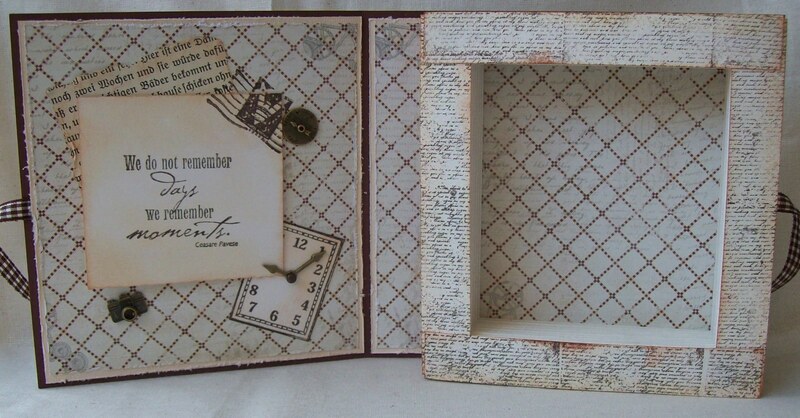 The centre panel was cut with spell binders dies . I used the faux porcelain technique to create the white crackled base and then stamped on top with Hero Arts engraved flowers stamp adding three layers of clear UTEE on top. 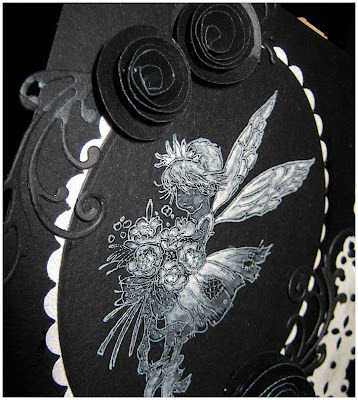 The corners of the card and underneath the spellbinders die where cut with my Cameo and then again three coats of clear UTEE where added to give plently of shine. More details of the faux porcelain technique can by found on my blog. Like several of the other guys I have opted for blues for my card for this challenge. My usual choice for a Monochromatic card would be Black and White, so I decided to try something a bit different for me and go with blues. Although it is quite a masculine card, I couldn't resist a couple of gems. Mine just sort of evolved into an orange themed card. I started off with the Maggie and it went from there. I personally find it really hard not to add other colours, especially when it comes to embellishments etc. It seems I am the brightest of the bunch! I guess I just love zingy colours, and orange is one of my favourites. For my card I stuck with the traditional black and white, but varied it by using my ice grey and warm grey promarkers to colour in the digi stamp from Digi Doodle Shop. I used the flitterglu and gilding flakes from Indigo Blu to create my background paper and the paper flowers were made using a punch. 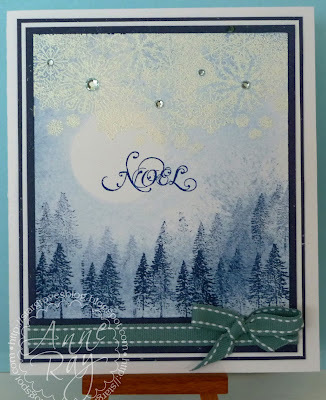 Trees, sentiment and white embossed snowflakes are all from the Indigo Blu "Here comes Santa" set, snowflakes look amazing in real life! I love Monochrome Challenges and always like to try a different colour from the normal Black and White! I went with this Purple and White Christening Box I made using Papermania papers, 12x12 card stock, Lili of The Valley stamp and a Mo Manning digi Stamp both coloured with promakers. Before you add your lovely creation would you please check the RED PARAGRAPH towards the top of this post if you want to be in with a chance of winning either of the prizes or a Top 5 position.